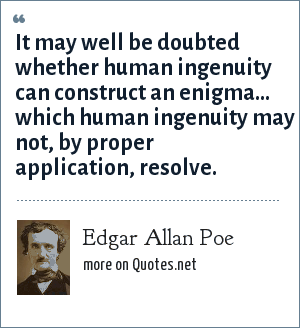 Edgar Allan Poe: It may well be doubted whether human ingenuity can construct an enigma... which human ingenuity may not, by proper application, resolve. "Edgar Allan Poe Quotes." Quotes.net. STANDS4 LLC, 2019. Web. 18 Apr. 2019. <https://www.quotes.net/quote/3076>.